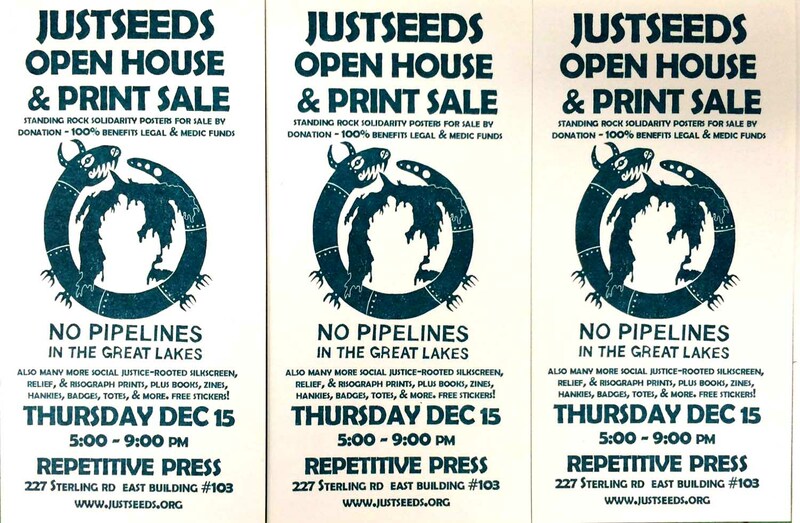 Justseeds Artists’ Cooperative’s Toronto-based members Jesse Purcell and Mary Tremonte are opening their silkscreen studio up for a late Fall warm-up and print sale. We still have Standing Rock solidarity posters that we printed for the Nov 5 action, selling for sliding scale donations to benefit the legal and medic funds. We also have many more social justice-rooted silkscreen, relief, offset, and risograph prints, plus books, zines, hankies, badges, totes, and more, including 2017 planners. Plus free stickers! Come warm it up with us in our cozy studio and share some political art to warm your spirits in these dark times. We are all in this together. Children welcome with their caregivers. Space has a ramp to enter but two steps to the washroom.